Ever since I blogged about iRead back in April, a lot has changed. We have introduced tons of new features, and there is really not one place where we have captured all of them. So this is my attempt to describe the features to our readers. This post from our official blog has more details. You don’t have to login to Facebook or some social network to access weRead. You can directly access your bookshelf from our destination site. If you have already used weRead in Facebook or one of the social networks, you can link your account and access the same account from the destination site. 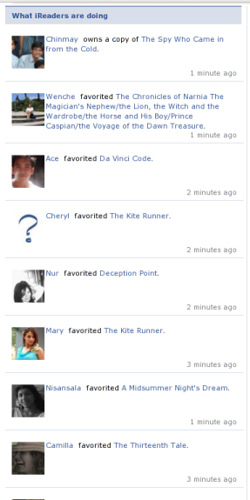 This Facebook feature allows you to find people who have similar book tastes like you. You can look for people of a specific gender, people in your network and people in specific age groups. 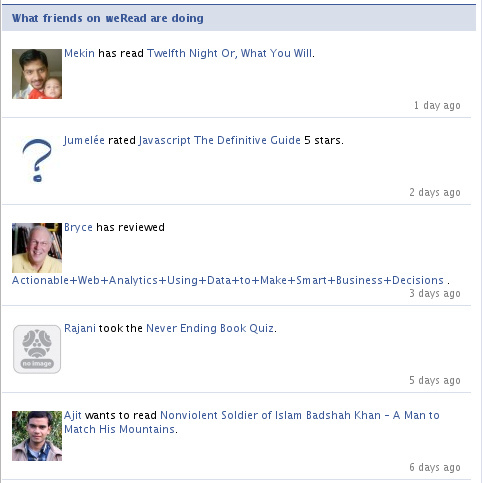 We now show activities from your friends on weRead in the homepage. This helps you keep track of which books your friends have been reading, and if they have participated in any discussions. This is the place to discuss with your friends and network about your favorite books, what you liked, what you didn’t like, why someone should or shouldn’t read a book. If you want to discuss about a specific author, talk about what works of an author are good, or what you would expect his next book to be like, this is the place to do it. Check out the latest discussions here. We now have catalogs from Amazon, Google and OCLC integrated into weRead. This means you have a whole range of books to choose from. More catalogs are coming soon. weRead is now available in 6 different languages – English(US), English(UK), German, French, Spanish (on Hi5 only) and Portuguese (on Orkut only). We have more languages being added soon. Want weRead in a local language? Help us translate weRead here. This will give you some sort of a ‘bookstore experience’ by allowing you to preview books. 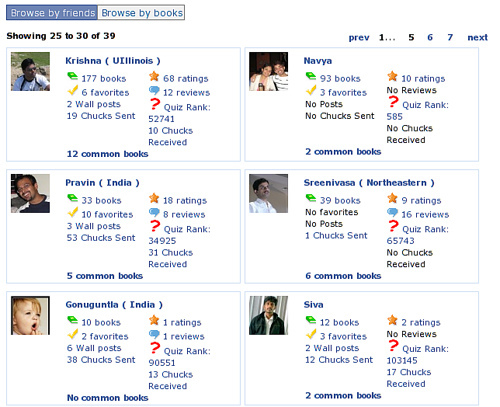 Curious to know how a book has been rated by people in your network? 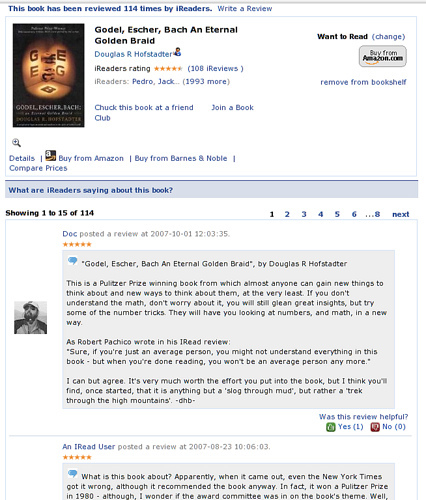 We now give you near realtime statistics about a book – how people have rated the book in your network, how many people own the book, how many have marked it favorite etc. 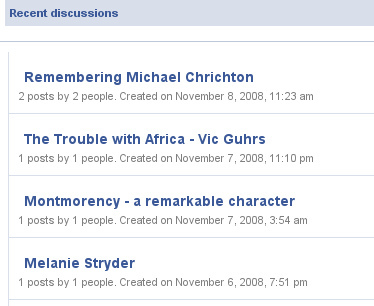 Each weRead user gets his/her own personal page that they can then share with their friends, bookmark, etc. In order to set up your own profile page, link your account from Facebook to our destination site and click on the “Profile” link in the top blue bar. Check out my profile page here. 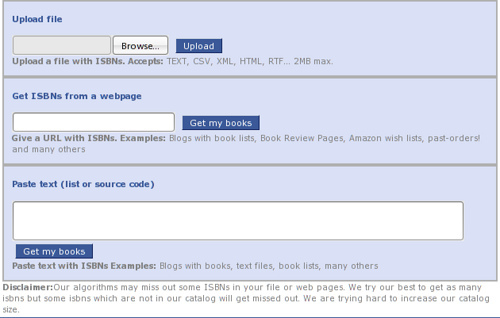 Want to advertise your bookshelf in your blog? It’s simple! Go to your profile page and then click on ‘Take weRead with you’, get the code and put it in your blog. You also have some customization that you can do before you get the code. Check out a demo here. 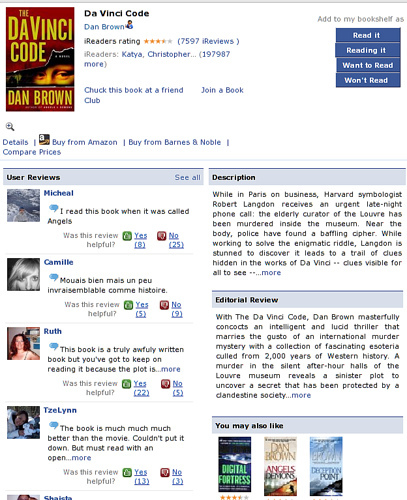 The Facebook Wall application allows you to post information about books, write reviews etc directly from the Facebook Wall. 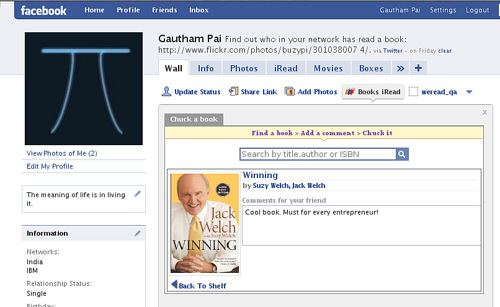 You can now chuck a book at your friends directly from the Facebook wall. Go to your Facebook profile page: http://www.facebook.com/profile.php. Under the Wall tab, you should see the Books iRead option. Clicking this opens a dialog that allows you to pick a book from your shelf or search for a book and chuck this at your friend. 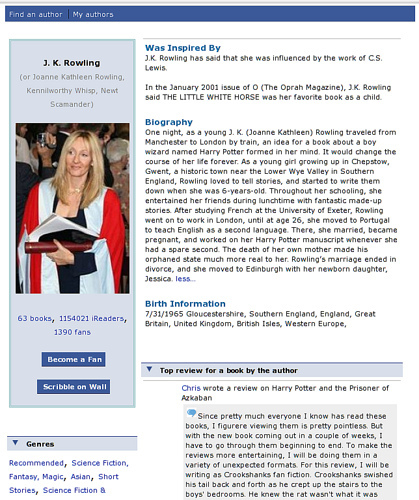 Under every book detail page, we show similar authors that will help you discover authors who write books similar to the one that you are viewing. weRead now has builtin suggestions in case you make a misspell some work while typing your query. We have launched some kind of a ‘Stumble upon’ feature. 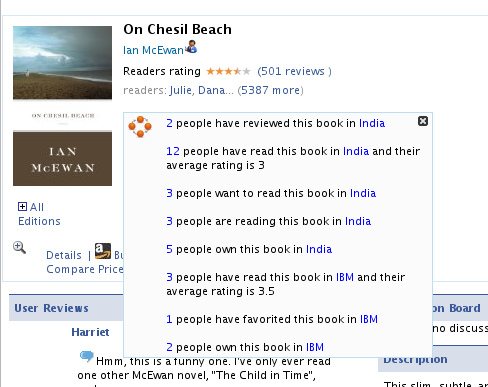 When you are viewing a book in weRead, you will see a button ‘See more like this’, clicking which, takes you to a random but related book. We now power the OCLC related books and reviews. We have also moved to bigger and more powerful servers, which means a better user experience for all our readers. As you see, we have been busy! We have tons of new and exciting features lined up and we promise to provide feature updates as frequently as possible. 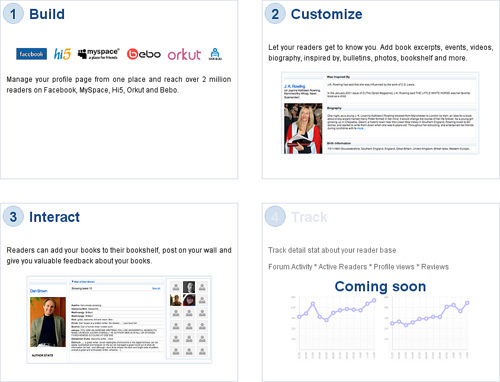 A lot of these features revolve around making weRead a truly social application. By the way, you can get some quick updates on weRead in our Twitter page. PS: Features and feature names are subject to change.